*NOTE: Special Programs, such as Magnet, Choice School & Special Education will not be found in the “Find My Route - Regular 2 Mile” link. *NOTE: Please call Student Transportation Services at 972-925-4BUS. *NOTE: Please be sure to reach out to your campus OR call Student Transportation Services at 972-925-4BUS. Every passenger, every bus, every seatbelt, always on! Texas State Law requires that students are required to wear seatbelts in a school bus that has seat belts for every passenger. Dallas ISD has school buses that have seat belts for every passenger. As a result, all passengers are required by law to wear seat belts anytime they are on a Dallas ISD school bus. Buses are the safest form of transportation for students going to and from school. Seatbelts provide the extra measure of security for passengers on the school bus in the unfortunate event of an accident. Every student will have an assigned seat on their route bus for the duration of the school year. The bus driver is required to assign seats for every passenger and submit an accurate seating chart by the 4th Friday of the new school year. 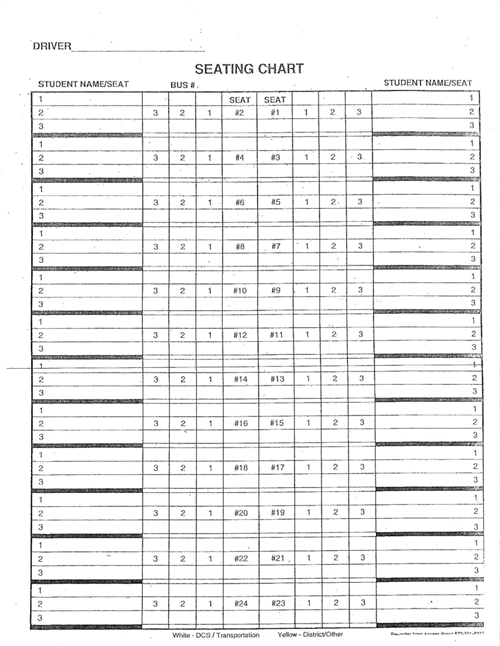 The seating chart will document the students seat assignment, first and last name, school campus and grade. The bus driver can and may reassign a student to a different seat temporarily or permanently. Any questions about a students seating assignment can be presented by calling 972-925-4BUS. To ensure timely, efficient and secure distribution of DART pass (es) to students eligible for school bus transportation per Board Policy CNA (LEGAL) and CNA (LOCAL). CNA (LEGAL): “A school district may use the state transportation allotment to provide a bus pass or card for another transportation system to each student who is eligible to use the regular transportation system of the district but for whom the regular transportation system of the district is not a feasible method of providing transportation. Education Code 42.155(l). FDC (LEGAL) indicates that a homeless student may continue in the school of origin for the duration of homelessness. This includes situations in which the child’s family becomes homeless between academic years or for the remainder of the academic year, if the child becomes permanently housed during an academic year. FDC (LOCAL) The District shall provide transportation to a student who is homeless to and from the school of origin, as provided by law. CNA (LEGAL) As a condition of receiving funds under the McKinney-Vento Homeless Assistance Act, a district shall ensure that transportation is provided, at the request of the parent or guardian (or in the case If such a student ceases to be homeless, and if requested by the parent, guardian, or unaccompanied youth, the District shall continue to provide transportation to and from the school of origin through the end of the school year. CNA (LEGAL) Regular eligible student” means a student who resides two or more miles from the student’s campus of regular attendance, measured along the shortest route that may be traveled on public roads, and who is not classified as a student eligible for special education services. Education Code 42.155(b)(1). Parents/Guardians - Please contact your child's campus.